Glue your fabric to two sides of the holder. Start shoving it full with batting. Glue one more side down and shove as much batting in as you can. You want it to be tight with batting so that you can shove pins in. Tuck the last side in and glue it down. 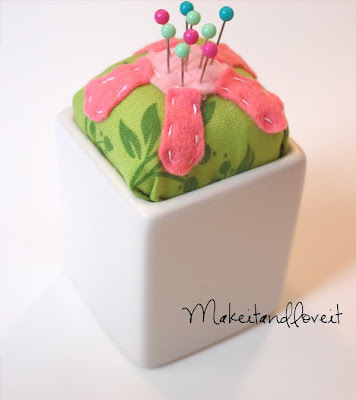 Cut out any shape or design out of your felt and then hand stitch it into place. Stick your pins in and now you have them nice and handy. Simple. I am so excited about this because a) I need a pin cushion in the worst way and b) I was too cheap to buy one at Joann’s. This one is much cuter anyway. I love it, and already went to porters with Ashlee!! Making them tonight!! And then I spy bag, and well the bag out of tea towels!! i just love it!! Thanks for sharing all you cute, fun, and easy ideas with us!! Ok Ashley so we(ashlee fincher and I)were totally excited to do this project tonight, but it was a little harder than we thought it would be! We thought oh about a 15 minute fun little crafty thingy that we could totally use! Well it was a little harder, we couldn’t get our fabric to look so nice and smooth like yours! Whats the secret? But once we got it all finished( 2 hours later) with the flower, it was so DANG cute!! So creative….So cute! LOVE IT! I love your blog! I’m starting in sewing, and your projects are perfect. Thanks for showing us how to make them. Usually you have to pay money for that. Your kindness is much appreciated! This is adorable and so easy! I saw you on the fave crafts mother's day ebook that I also contributed to. And well, we have the same name so I thought I would come check out your blog! And I am so glad I did…what a huge amount of information at my fingertips! I made one and posted about it here! So cute! But just a suggestion – I think it would be easier to sew the felt piece on before gluing the fabric into place. 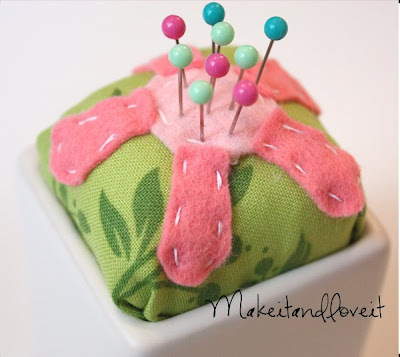 I do not sew alot, but have an affinity for pin cushions. A little trick I started doing is putting in the center of my batting a piece of fine steel wool to sharpen the needles as they are placed into cushion. Cut the steel wool with dull scissors to sharpen as well. I'm thinking of modpodging a baby food jar and making this! I like the idea of sewing on the felt before making it because I'm not sure how you get the needle up from the other side. Thanks again for great ideas! I found an adorable butterfly candy dish and made a pin cushion out of it after seeing your idea. I posted a pic on my blog at http://www.simplejoycrafting.blogspot.com. Thank you for another great tutorial, I'm in love with your site! Thank you so much for sharing this tutorial! I’ve been looking for a cute and easy pin cusion tutuorial for a while but couldnt find anything to my liking and my skill! This one is perfect! So simple and pretty! Will definitely make it very soon! Love it, great idea to keep pins safe!